The edX LMS and Studio have several features that are extensions of the core XBlock libraries (https://xblock.readthedocs.io). These features are listed below. You can also render an individual XBlock in HTML with the XBlock URL. These are properties and methods available on self.runtime when a view or handler is executed by the LMS. anonymous_student_id: An identifier unique to the student in the particular course that the block is being executed in. The same student in two different courses will have two different ids. publish(block, event_type, event): Emit events to the surrounding system. Events are dictionaries that can contain arbitrary data. XBlocks can publish events by calling self.runtime.publish(self, event_type, event). The event_type parameter enables downstream processing of the event since it uniquely identifies the schema. This call will cause the runtime to save the event data in the application event stream. XBlocks should publish events whenever a significant state change occurs. Post-hoc analysis of the event stream can yield insight about how the XBlock is used in the context of the application. Ideally interesting state of the XBlock could be reconstructed at any point in history through careful analysis of the event stream. In the future, these are likely to become more formal XBlock services (one related to users, and the other to event publishing). These are class attributes or functions that can be provided by an XBlock to customize behavior in the LMS. student_view (XBlock view): This is the view that will be rendered to display the XBlock in the LMS. It will also be used to render the block in “preview” mode in Studio, unless the XBlock also implements author_view. has_score (class property): True if this block should appear in the LMS progress page. get_progress (method): See documentation in x_module.py:XModuleMixin.get_progress. icon_class (class property): This can be one of (other, video, or problem), and determines which icon appears in edx sequence headers. There is currently no way to provide a different icon. To participate in the course grade, an XBlock should set has_score to True, and should publish a grade event whenever the grade changes. The grade event is a dictionary of the following form. The grade event represents a grade of value/max_value for the current user. The user_id field is optional, the currently logged in user’s ID will be used if it is omitted. A block cannot modify the value of any field with a scope where the user property is UserScope.NONE. studio_view (XBlock.view): The view used to render an editor in Studio. The editor rendering can be completely different from the LMS student_view, and it is only shown when the author selects “Edit”. author_view (XBlock.view): An optional view of the XBlock similar to student_view, but with possible inline editing capabilities. This view differs from studio_view in that it should be as similar to student_view as possible. When previewing XBlocks within Studio, Studio will prefer author_view to student_view. non_editable_metadata_fields (property): A list of xblock.fields.Field objects that should not be displayed in the default editing view for Studio. A block cannot modify the value of any field with a scope where the user property is not UserScope.NONE. These instructions are temporary. Once XBlocks are fully supported by edx-platform (both the LMS and Studio), installation and testing will be much more straightforward. To enable an XBlock for testing in your devstack (https://github.com/edx/configuration/wiki/edX-Developer-Stack), follow these steps. Add the block to your courses’ advanced settings in Studio. Add your block into your course. To deploy your block to your own hosted version of edx-platform, you need to install it into the virtualenv that the platform is running out of, and add to the list of ADVANCED_COMPONENT_TYPES in edx-platform/cms/djangoapps/contentstore/views/component.py. The XBlock URL supports HTML rendering of an individual XBlock without the user interface of the LMS. To use the XBlock URL and return the HTML rendering of an individual XBlock, you use the following URL path for an XBlock on an edX site. 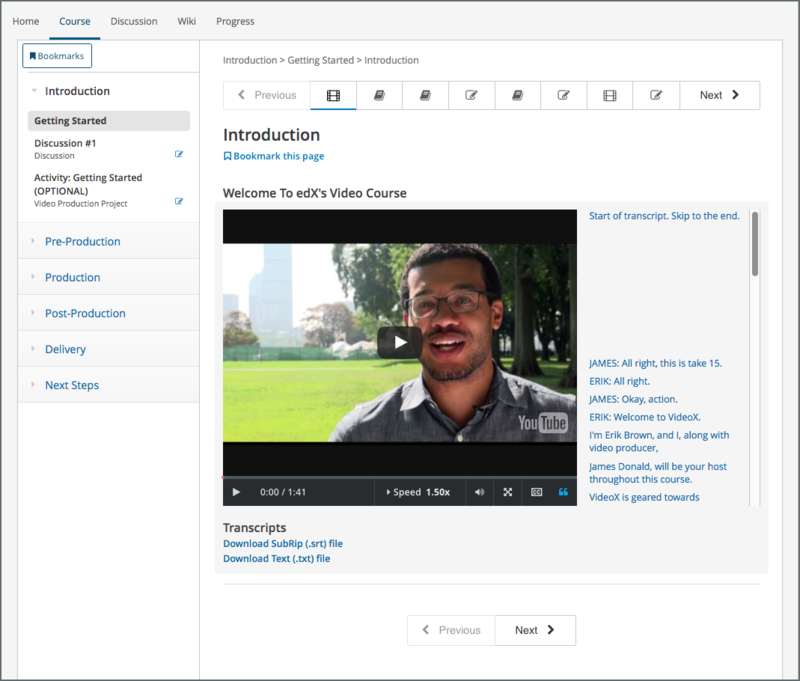 The usage_id is the unique identifier for the problem, video, text, or other course content component, or for sequential or vertical course container component. There are several ways to find the usage_id for an XBlock in the LMS, including viewing either the staff debug info or the page source. For more information, see Finding the Usage ID for Course Content. 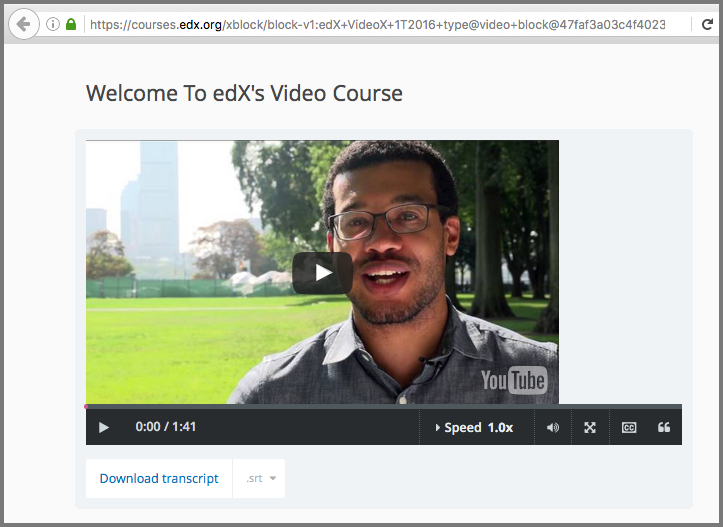 For example, a video component in the “Creating Video for the edX Platform” course on the edx.org site has the following URL. This video component appears as follows in the LMS. To construct the XBlock URL for the same video component, you obtain its usage_id and then use the following URL format. When you use this URL, the video component appears in your browser as follows. For courses created prior to October 2014, the usage_id begins with i4x://, as in the following example.